Every day there’s something happening on Martha’s Vineyard. But if you’re looking to make the most out of your time here, you want to know the absolute must-see and must-do activities. 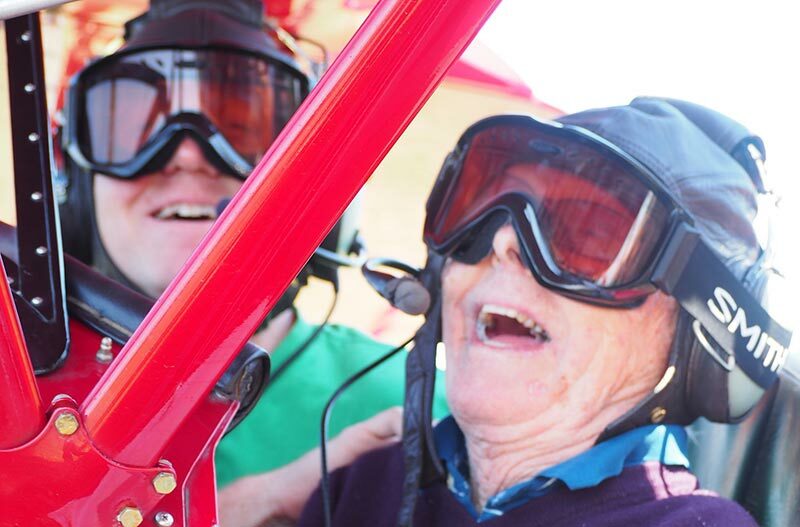 We’ve gathered a list of some of the most popular annual events you won’t want to miss. And continue to check our comprehensive daily calendar of events for a full list of Island happenings. April 21: Vineyard Conservation Society’s Earth Day Beach Clean Up, various beaches on Martha’s Vineyard. The 25th annual Earth Day Beach Clean Up invites anyone to come and assist with cleaning and removing trash and debris from their favorite local beach, followed by an after party at the Sailing Camp Park in Oak Bluffs. April 26-29: Spectrum Film Festival, MV Film Society, Vineyard Haven. The Martha’s Vineyard Film Society’s newest four-day festival presents “a world perspective on LGBT stories, people, and issues” with a variety of films, guest speakers, discussions, and a special event focused on LGBT youth. May 5: Ride the Vineyard MS Cycle Race. Admire the quaint charm and beautiful ocean views of Martha’s Vineyard. Choose from 18-, 30-, and 60-mile routes, and enjoy the landscape of the Island while benefiting the National Multiple Sclerosis Society. May 5: MVY Radio’s Annual Big Chili Contest, Portuguese-American Club, Oak Bluffs. Celebrate the hottest and tastiest of chilis while enjoying live entertainment by the traditional mariachi band. 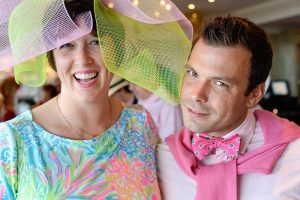 May 11-13: Pink & Green Weekend, various locations in downtown Edgartown. Hosted by the Edgartown Board of Trade, this annual festival celebrates Mother’s Day and spring, with various activities, events, and shopping sales, in Edgartown. May 12: MV Mini Maker Faire, Agricultural Hall, West Tisbury. Enjoy a showcase of Vineyard-made arts and crafts, science, and engineering, food and music, fire and water. Maker Faire is a show-and-tell format for people of all ages that brings out the “kid” in all of us. May 13: Art of Flowers, Featherstone Center for the Arts, Oak Bluffs. Every May for almost 20 years, Featherstone has celebrated the season by filling its main gallery with flora of all sorts depicted in just about every possible medium. The arts campus welcomes all artists, from novices to professionals, to participate, and the flower show tends to attract the most contributors. May 19: Martha’s Vineyard Marathon and Half Marathon, Martha’s Vineyard Regional High School, Oak Bluffs. Both the full and the half marathon are relatively flat with a few gentle rollers in the full marathon. Whether you’re trying to qualify for Boston or just want to run a beautiful race, see why Martha’s Vineyard is so famous and a spend a few extra days pre or post race. May 24-27: Environmental Film Festival, MV Film Center, Vineyard Haven. Four days of environmental films, discussions, and an art exhibit by MVRHS students. A Q and A follows each film with experts, community members, and special guests. May 26, 27: Vineyard Artisans Festivals Grange Hall, West Tisbury. 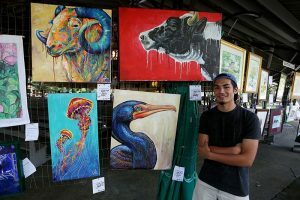 This summer tradition brings dozens of local artisans together to exhibit their work. The Memorial Day show takes place May 26 and 27, and the 21st annual summer festival returns every Sunday from June 10 to Sept. 30, and every Thursday from July 5 to August 30. May 27: Memorial Day Road Race, Oak Bluffs. Includes a 5K run/walk and one-mile fun run. Starts at Ocean Park and finishes at the Summercamp Hotel. All proceeds to benefit Hospice of Martha’s Vineyard. Start times: 9:30 am fun run, 10 am 5K. May 29: Tisbury Water Works Memorial Day Picnic. Tashmoo Spring Pumping Station, Vineyard Haven. On Memorial Day, from noon to 4 pm, everyone on the Vineyard is welcome to come to the annual Memorial Day Picnic. Families and individuals are invited to bring a picnic lunch, settle in, and enjoy rowboating on the pond, children’s games, watermelon, and ice cream cones. June 14, 16: Taste of the Vineyard, Daniel Fisher House, Edgartown. The Martha’s Vineyard Preservation Trust holds its annual food and drink extravaganza, highlighting the offerings of Vineyard chefs, restaurants, and food purveyors. The highly anticipated event includes the Gourmet Stroll on Thursday, June 14, and the Patrons’ Stroll & Auction on Saturday, June 16. Tickets go on sale to Preservation Trust members only. June 16: Harbor Festival, Oak Bluffs Harbor. 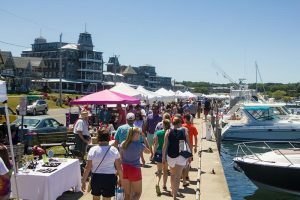 The annual kickoff of summer, this event features Island vendors, nonprofits, and artisans along the harbor to celebrate the arrival of the new season. The kid-friendly festival offers live music, art, crafts, food, and summer-themed festivities for the whole family. Festivalgoers can do some dancing, eat local delicacies, and celebrate the onset of the Island’s most dynamic season. June 17: Father’s Day Car-B-Q, Harbor View Hotel, Edgartown. A Power Cruise Parade followed by a Classic Car Show on the lawn of the Harbor View Hotel, a photo exhibit of antique Vineyard autos by Martha’s Vineyard Museum, and a BBQ with favorites cooked to order. June 22-25: Filmusic Festival, MV Film Center, Vineyard Haven. A weekend of feature films and musical performances that celebrates the convergence of music, culture, and film. June 23: Morning Glory Farm Strawberry Festival, Morning Glory Farm, Edgartown. An annual celebration of the season’s fruit arrival, with plenty of berries to go around. Offering all things strawberry, including their famous strawberry shortcake, plus face painting, games, and farm animals. June 30: Martha’s Vineyard Museum Evening of Discovery, Martha’s Vineyard Museum/Old Marine Museum location, Vineyard Haven. The museum’s 20th annual high summer fundraiser event, this year celebrating the Golden Age. Hollywood glamour–era dress encouraged. July 4: Annual Kids’ Parade at the Tabernacle, Oak Bluffs. Open to all Island children and their parents. Begins on West Clinton Avenue. No motorized scooters, bikes, etc., please. Followed by an ice cream social under the tent. 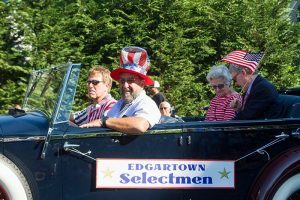 July 4: Independence Day Parade and Barbecue, 5 pm, and fireworks after dark, Edgartown. July 4: Murdick’s 5-Mile Run the Chop Challenge, Vineyard Haven. Murdick’s Run the Chop Challenge is held on July Fourth every year, and has been in existence for over 15 years. Over that time the 5-mile road race has generated over $60,000 for the betterment of Vineyard kids. July 8: Tisbury Annual Street Fair, Vineyard Haven. Tisbury celebrates its birthday at its annual street fair on Main Street. Vendors, games, great food, and fun for the whole family. July 9: David Bromberg Quintet, Old Whaling Church, Edgartown, 8 pm. Part of the ongoing Martha’s Vineyard Summer Concert Series. July 12-15: Vineyard Cup Regatta, Vineyard Haven. A full weekend of racing, socializing, and dining, benefiting Sail Martha’s Vineyard. July 16: Capitol Steps, Martha’s Vineyard Performing Arts Center, Oak Bluffs, 8 pm. Part of the ongoing Martha’s Vineyard Summer Concert Series. July 18: The Mavericks, Martha’s Vineyard Performing Arts Center, Oak Bluffs, 8 pm. Part of the ongoing Martha’s Vineyard Summer Concert Series. July 18-21: Bluewater Classic Fishing Tournament, Oak Bluffs Marina. This annual event welcomes fishing enthusiasts with vessels that have the range to fish in the vicinity of northeast canyons, raising funds for the Island Autism Group of Martha’s Vineyard and the MGH Colon Cancer Research Fund in memory of Kevin Glynn. July 19: Cowboy Junkies, Old Whaling Church, Edgartown, 8 pm. Part of the ongoing Martha’s Vineyard Summer Concert Series. July 19-21: Edgartown Yacht Club Race Weekend, Edgartown. 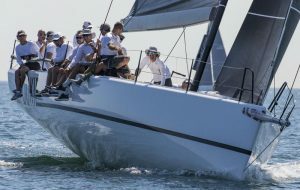 Every year in July, Edgartown Yacht Club makes its own unique contribution to the maritime traditions of Martha’s Vineyard by perpetuating its historic ’Round-the-Island Race and its more recently inaugurated ’Round-the-Buoy Races (’RTB). Together, the events comprise three full days of sailing action on Martha’s Vineyard. July 21: Featherstone Center for the Arts Gala, Oak Bluffs. A festive event including cocktails, dinner, and a silent auction to benefit Featherstone. Over the past year Featherstone has expanded its campus and programming, and for the first time will be hosting this annual event on its campus. July 21-22: Feast of the Holy Ghost, Oak Bluffs. Oak Bluffs celebrates two days of games, eating, dancing, and merrymaking for the annual Feast of the Holy Ghost weekend. The two-day event includes a parade and a community dinner at the Portuguese-American Club. The event has been an annual tradition since the 1920s, when it was initiated to connect Azorean immigrants with their homeland. July 25: Deer Tick, Lampost, Oak Bluffs, 8 pm. Part of the ongoing Martha’s Vineyard Summer Concert Series. July 28: Cottagers White & Glitter Party, Oak Bluffs. A fundraiser for Cottagers and a super-fun time. Get out your glitter and prepare to party. 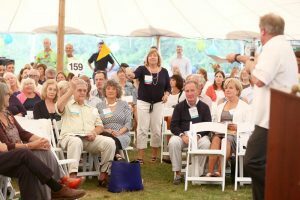 July 29: Possible Dreams Auction, Winnetu Oceanside Resort, Edgartown. Celebrating 40 years of support for the programs of Martha’s Vineyard Community Services. This annual star-studded event highlights the passion and dedication of Island community, staff, volunteers, sponsors, donors, and everyone who makes each auction so special. July 30-August 3: Martha’s Vineyard Documentary Week, MV Film Society, Vineyard Haven. Documentary films have become the conscience of the nation, providing a deeper study of contemporary, and often unnoticed, social issues. MV Film Society hosts this important event in recognition of the rising importance of documentaries to public dialogue. August 1: South Beach Sand Sculpture Contest, Edgartown. An annual celebration and competition of sand creations, hosted by the Edgartown Board of Trade. Categories for adults and kids, and a popular “people’s choice” award, where the beach crowd picks their favorite. August 2: Patty Griffin, Old Whaling Church, Edgartown, 8 pm. Part of the ongoing Martha’s Vineyard Summer Concert Series. August 5, 6: Islanders Write, presented by The MV Times, Grange Hall, West Tisbury. An evening panel discussion on Sunday night followed by a full day of panel discussions, workshops, author signings, and readings. August 6: All-Island Art Show, Tabernacle, Oak Bluffs. Join the Martha’s Vineyard Camp Meeting Association for the annual All-Island Art Show. Enjoy the beauty and creativity of Island artists, sponsored by the All-Island Art Committee. August 6-11: Martha’s Vineyard African-American Film Festival, Martha’s Vineyard Performing Arts Center, Oak Bluffs. The Run&Shoot Filmworks Martha’s Vineyard African-American Film Festival is now entering its 16th year on Martha’s Vineyard. It has screened and promoted feature, documentary, and short films produced by and starring African-Americans from across the world. August 8, 9: David Sedaris, Old Whaling Church, Edgartown, 8 pm. Part of the ongoing Martha’s Vineyard Summer Concert Series. August 9-11: Built on Stilts Dance Festival, Union Chapel, Oak Bluffs. A two-week dance extravaganza features dozens of dance troupes and individuals, both amateur and professional, local and imported, representing just about every style of dance you can think of (and a few you might not have expected). August 13: Toots & The Maytals, Martha’s Vineyard Performing Arts Center, Oak Bluffs, 8 pm. Part of the ongoing Martha’s Vineyard Summer Concert Series. August 14: WMVY Presents Mavis Staples, Martha’s Vineyard Performing Arts Center, Oak Bluffs, 8 pm. WMVY 35th Anniversary Benefit Concert, part of the ongoing Martha’s Vineyard Summer Concert Series. August 15: The Grand Illumination of the Oak Bluffs Campground, a.k.a. “Illumination Night,” Oak Bluffs. 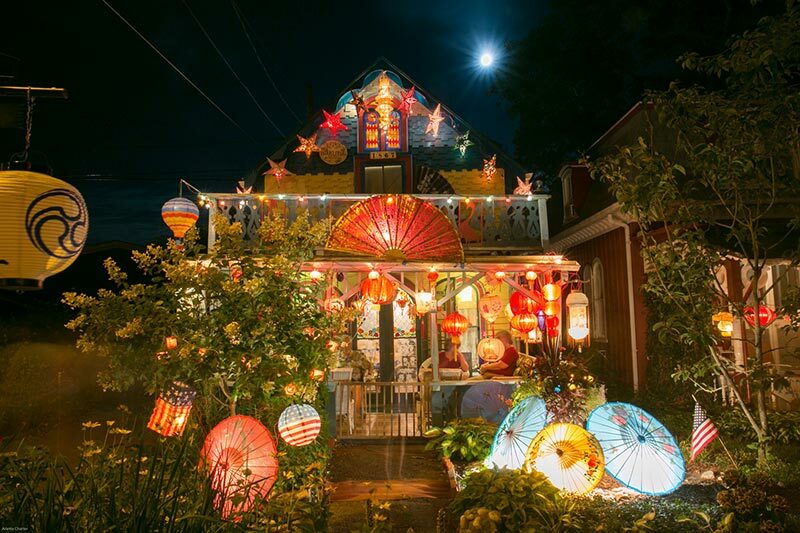 The iconic gingerbread cottages will be adorned with colorful Chinese and Japanese lanterns, which will be lit at dark. A Community Sing will precede the Grand Illumination, and the Vineyard Haven Band will play at the Tabernacle at 8 pm. The event is open to the public with a suggested freewill offering. August TBA: Chilmark Road Race, Chilmark. Since 1978, the Chilmark Road Race has been run along beautiful but oh-so-hilly Middle Road. Proceeds from the race are donated to the Town Affairs Council to assist in the operations of the Chilmark Community Center and make scholarships to year-round residents possible. 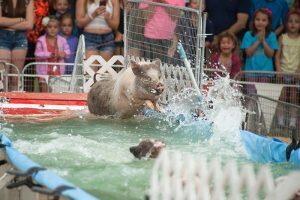 August 16-19: 157th Annual Martha’s Vineyard Agricultural Fair, Agricultural Hall, West Tisbury. Rides, games, live music, livestock, competitions, craft demonstrations, food, shopping, art show, and awards for homegrown vegetables, fruits, flowers, and homemade goodies. August 17: Band Concert and Fireworks, Ocean Park, Oak Bluffs. Hosted by Oak Bluffs Fireman’s Civic Association. Band performance starts at 8 pm, and fireworks will light up the sky around 9 pm. August 18-21: Built on Stilts Dance Festival, Oak Bluffs. See August 9 description. August 19: Paula Poundstone, Martha’s Vineyard Performing Arts Center, Oak Bluffs, 8 pm. Part of the ongoing Martha’s Vineyard Summer Concert Series. August 20: Keb Mo, Martha’s Vineyard Performing Arts Center, Oak Bluffs, 8 pm. Part of the ongoing Martha’s Vineyard Summer Concert Series. August 21: Black Violin, Martha’s Vineyard Performing Arts Center, Oak Bluffs, 8 pm. Part of the ongoing Martha’s Vineyard Summer Concert Series. August 30-Sept. 2: Martha’s Vineyard Jazz and Blues Summerfest, Oak Bluffs. This annual music festival plays host to music lovers from all over the United States and Europe. Summerfest producers believe that great music and medicine can radically change the course of one’s life, a family’s future, and a community’s well-being. Summerfest was launched in 2008 to support regional breast cancer initiatives. August 31-Sept. 2: Vineyard Artisans Labor Day Festival, Grange Hall, West Tisbury. The largest art show on Martha’s Vineyard, featuring the Island’s top artists with unique furniture, clothing, ceramics, jewelry, and fine art. Weaving, fine furniture, pottery, leather goods, oil paintings, pastels, mixed media, sculpture, wampum jewelry, hand-knit items, clothing, photography, handmade books, and much more. Indoors and outdoors, rain or shine. Sept. 4-9: Martha’s Vineyard International Film Festival, MV Film Society, Vineyard Haven. The 2018 Martha’s Vineyard International Film Festival will present a selection of films from around the globe by International filmmakers. Films drawn from top-notch festivals like Sundance, Berlin, and Cannes, with a few surprises thrown in. 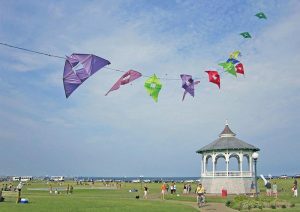 Sept. 8: Annual Wind and Kite Festival, Ocean Park, Oak Bluffs. Free kitemaking and kite-flying competition for kids and adults. Plus Frisbee games, model sailboat racing, live music, bubbles, and more. Sept. 9-Oct. 13: Martha’s Vineyard Striped Bass & Bluefish Derby (Awards ceremony Oct. 14). For over 70 years, “the Derby” has been a time to renew friendships, share a cup of coffee, and create memories that fuel the winter’s exaggerated fishing stories. It is a time when all are able to refocus on the natural beauty of this Island sanctuary. Sept. 15: Tivoli Day Festival, Circuit Avenue, Oak Bluffs. The Oak Bluffs Association holds its annual Tivoli Day celebration, featuring live outdoor music all day, as well as food and retail vendors set up on the street, and special sales and events in nearby Oak Bluffs stores. Circuit Avenue will be closed to traffic during the event, which celebrates the end of the summer and the beginning of the Island’s shoulder season. Sept. 16: Kids Day at the Martha’s Vineyard Striped Bass & Bluefish Derby. Sept. 22: MV Craft Beer Festival, Oak Bluffs. Oct. 6, 7: 15th annual Art of Chocolate Festival, Featherstone Center for the Arts, Oak Bluffs. This tasty festival features a Friday-night preview party, where you can enjoy the dream-come-true experience of sampling everything chocolate your heart desires, and Saturday and Sunday afternoon pay-as-you-taste events. Oct. 7: Vineyard Artisans Columbus Day Festival, Grange Hall, West Tisbury. One day only to catch all your favorite Island artisans. Weaving, fine furniture, pottery, leather goods, oil paintings, pastels, mixed media, sculpture, wampum jewelry, hand-knit items, clothing, photography, handmade books, and much more. Indoors and outdoors, rain or shine. Free parking and free admission. Playground for kids. Oct. 17-21: Martha’s Vineyard Food & Wine Festival, Edgartown. 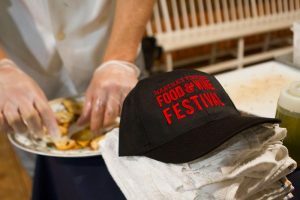 The Martha’s Vineyard Food & Wine Festival invites you a four-day feast celebrating the Vineyard’s best culinary talent — and the farmers, fishermen, oyster producers, and artisans they work with — paired with guest chefs and vintners from around the world for a unique-to-the-Island experience. Oct. 28: Happy Haunting, Edgartown. Edgartown’s annual Halloween festivities. Come into town for continued Halloween fun, while little ghosts and goblins trick-or-treat from business to business. Nov. 16: Featherstone Holiday Gift Show Preview Party, Featherstone Center for the Arts, Oak Bluffs. Featherstone’s annual Holiday Gift Show ranks as one of the top artistic attractions of the season on Martha’s Vineyard. Come preview the wares available, and celebrate the local artists and makers that produce their work for this popular show. Nov. 17-Dec. 16: Featherstone Holiday Gift Show, Featherstone Center for the Arts, Oak Bluffs. Open daily noon to 4 pm. from Nov. 17 through Dec. 16. Gifts galore,including apparel and accessories, cards, calendars, dog goods, unique soaps, gift boxes, jewelry, pottery, photography, paintings, posters, purses, scarves, ornaments, and stocking stuffers. All sales benefit Vineyard artists and Featherstone, which is a not-for-profit year-round art center. Living Local Harvest Festival, Agricultural Hall, West Tisbury. This annual festival celebrates and educates on important Island issues such as sustainable agriculture, local food advocacy and education, marine life, renewable energy, resource and land conservation, and local living economies. Morning Glory Farm Pumpkin Festival, Morning Glory Farm, Edgartown. 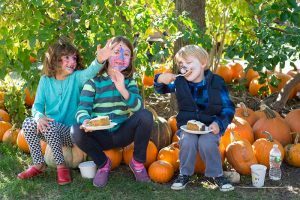 Pumpkin games, hayrides, live music, the fabulous trebuchet, and much more: This is an annual celebration of all things pumpkin. Free admission. Oak Bluffs Tree Lighting, Post Office Square, Oak Bluffs. The annual lighting of the Christmas tree. Island Community Chorus Holiday Concert, Old Whaling Church, Edgartown. The Island Community Chorus launches the season with its annual holiday concert. A reception with treats served by the choir follows the concert. Christmas in Edgartown, Edgartown. A winter weekend festival not to be missed, including family-friendly events that capture the magic of the holidays. Reflections of Peace Christmas Concert, Oak Bluffs. A welcoming haven of serenity and loveliness, held every Christmas season. This well-loved concert gathers many of the Island’s top musicians performing to benefit Hospice of Martha’s Vineyard.